Battersea Dogs and Cats Home has a long history of caring for dogs which have been abandoned or whose owners were unable to cope. Unfortunately many dogs at Battersea arrived because their previous owners only considered what they wanted their dog to look like – not its background and behaviour patterns. The most popular dogs purchased by misinformed town dwellers are, incredibly, Border Collies. These dogs love mental and physical stimulation – they are bored silly in the city and need space and air and things to chase. This month, the dogs which require immediate housing are Jason and Sasha. Jason is a lovely big boy who loves his food and toys. He does need to be taught some manners so will need confident, strong owners who can set the ground rules from day one, but once he is in the right home he will be a loyal and loving companion. He will need to live in a large house near the countryside or in a semi-rural location, with lots of space to run around. 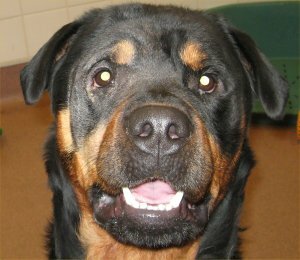 His new owners will have had Rottweilers or similar breeds before. He cannot live with other dogs or children, but will need more than one carer as he forms strong bonds with people quickly. If you think you can offer Jason a loving home please contact the rehoming line on 0207 6279234 or apply online at www.dogshome.org, quoting reference 08/01061. Sasha is a fun playful young lady who is very responsive and friendly. She can come across as overbearing but this is all a front: underneath all that fur she is quite sensitive. Sasha becomes frustrated on lead and is wary around other dogs, and her new people should be prepared to spend a lot of time on this. She will need consistency with her training and will benefit greatly from a set routine. Sasha will need to live in a quiet, semi rural location due to her wariness around new people. This environment should have a low dog population due to her lead frustration around other dogs. It is essential that Sasha’s new home has a private enclosed garden with no neighboring dogs. Ideally Sasha should live in a multi-carer household to reduce the likelihood of her overbonding with one person. She is not to live with children due to the consistency needed in her training; however, older mature teens would be considered as long as they will be involved in her training. 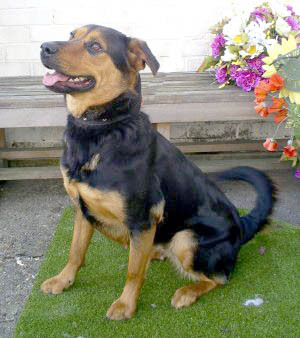 Sasha needs owners who have experience of owning guarding breeds such as German Shepherds or Rottweilers, as she has typical breed traits and will need owners who understand this. If you think you can offer this lovely girl a home contact a member of the rehoming team on 02076277884, or email behaviourrehoming@dogshome.org and quote reference 2007/06188. If you think you can offer this bright spark the home she needs please call Battersea Dogs & Cats Home, London on 020 7627 9234, apply online at www.dogshome.org or come down to the Home and register, quoting reference 08/00824.